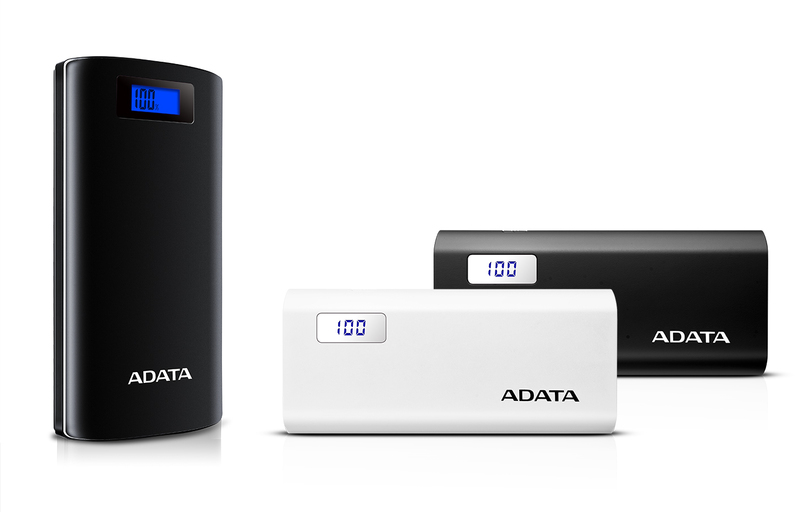 Taipei, 21 October 2016 – ADATA Technology, a leading manufacturer of highperformance DRAM modules, NAND Flash products, and mobile accessories today launched the ADATA P20000D and P12500D smart display power banks. The two models use high efficiency and long lasting lithium-ion cells tested and certified to the most exacting standards. They feature digital displays that show remaining charge percentage to better inform users. Dual USB ports output atotal of 2.1A to enable quick charging of two devices simultaneously. Both power banks offer a high degree of safety, with six protective circuits and a shock and fire resistant enclosure. The ADATA P20000D further includes a high luminance LED flashlight. Sufficient for multiple charges of smartphones, tablets, and mobile devices such as wireless headphones and game controllers at 20000mAh and 12500mAh respectively, the P20000D and P12500D are smart and! portable power stations. The ADATA P20000D and P12500D forego the vagueness and uncertainty of simple flashing lights or bars, instead incorporating highly visible digital displays that show exactly how much charge is left, shown in easy to understand percentage points. Rather than going for the traditional “more or less” approach, ADATA designers this time opted to deliver complete charge info accuracy, as befits large capacity power banks. The large capacity of the ADATA P20000D and P12500 means they are enough for up to 6.4 smart phone charges, 1.8 average tablet charges. Charging is made more efficient thanks to the inclusion of two USB ports that output a total 2.1A, so users can charge two devices at once to save time, whether recharging smartphones, tablets, game controllers, wireless headphones, and any other device with a USB port. From carefully-tested power cells to fire, shock, and vibration resistant enclosures, the P20000D and P12500D protect users, devices, and the environment. They employ intricate circuitry to guard against overcharge, overheating, overcurrent, under current, over discharge, and shorting out. As an added extra, the ADATA P20000D doubles as a bright LED flashlight to help users find their way and illuminate darkened environments. The ADATA P20000D and P12500D are backed by a one year warranty.